The Rolling In The Deep singer is apparently top choice as the band's special guest, said The Sun. Other female stars the band want to line up for their Hyde Park shows are Lady Gaga, Paloma Faith and Florence Welch. 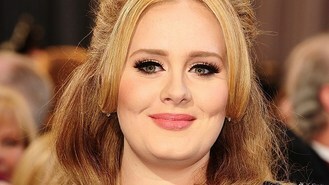 A source told The Sun: "The Stones would love to get Adele on with them. It would be a massive coup, even for them, because she's been a bit reclusive since her son Angelo James was born. "She is the name they want to announce as their special guest - and their invite should be special enough to get her out on stage. At the minute it's 50/50 that she'll do it, but Mick is quietly confident he can pull it off. They want to make the Hyde Park shows a highlight of their tour, and her appearing would make it really special." The Stones have made it a regular feature of gigs to bring on a big female star during their latest tour, with Sheryl Crow recently joining them on stage in Chicago. The source continued: "The group think female performers are a great complement for Mick ever since Florence Welch got on stage with them at London's O2 Arena last year for Gimme Shelter. Gaga, Paloma and Flo would all do well in the Hyde Park shows, but Adele is the big prize this summer." Hyde Park plays host to the Rolling Stones' 50 and Counting Tour on July 6 and 13.